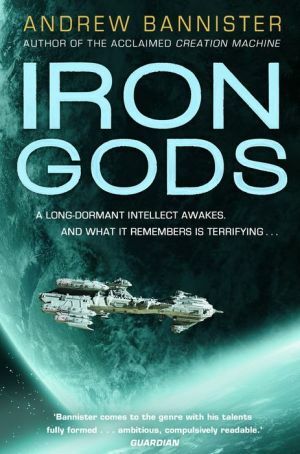 From Andrew Bannister, author of Creation Machine, comes Iron Gods--another thrilling, heart-in-mouth new science fiction novel of the Spin. In the depths of space, a beacon has awakened. And an ancient technology has begun to stir. As its memory returns, with it comes a terrifying knowledge―a grave warning about the future of the Spin that has been concealed for ten thousand years. Ten thousand years after the events of Creation Machine, the Spin is in decline and the beleaguered slave economy of the Inside is surrounded by rebel civilizations. A group of escapees from the vast forced-labor unit known as the Hive have stolen the last of the Inside's ancient warships and woken it from an enforced trance that had lasted for millennia. And someone has destroyed a planet that didn't exist, and halfway across the Spin, something has gone wrong with the sky.